Students solve the first step of the Honey Mystery by identifying hair at the scene of a crime. They also analyse real hair, from people and other animals. Pooh on his picnic blanket with an empty pot of honey. 7 suspects, with their numbers on, lined up nearby. There has been a crime among the stuffed animals. 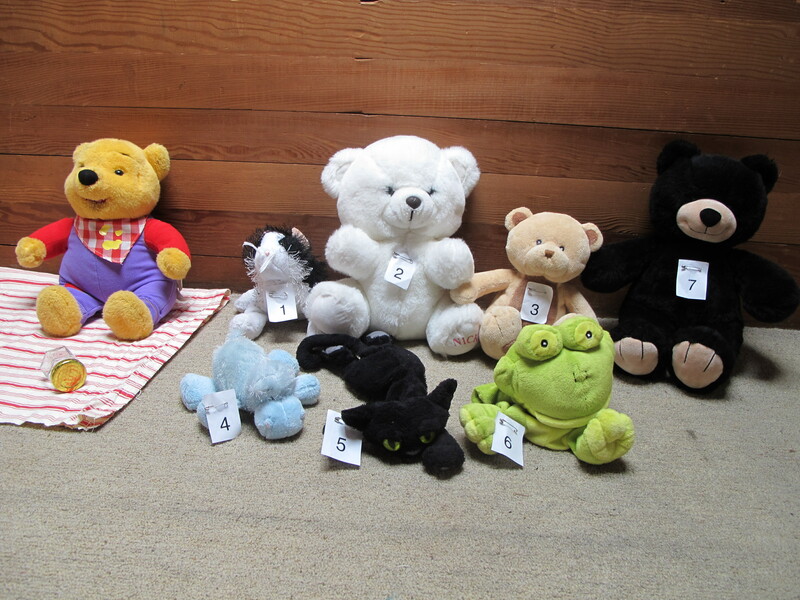 7 animals were found near the scene of the crime and are suspects (3 bears, 2 cats, a hippo and a frog). You will solve the crime over three lessons (Honey Mystery 1, 2 and 3). Each lesson you will do a different forensic technique collecting more evidence to figure out who stole the honey. The investigators scoured the crime scene and found some hair samples on the empty honey pot. They put on their gloves, and collected the hair samples in specimen bags. Today you will do hair analysis to figure out who left their hair on the honey pot, and narrow down the suspects. You will also look at some real hairs from people and other animals. Follow this lesson with The Honey Mystery 2 lesson. This lesson was originally done with buddy classes at Gordon. Half of each class, along with their buddies did the Hair Analysis activity (Honey Mystery 1), while the other half did the Real Hair Analysis, then they switched. See second round pics for ingridscience stuffies - needs refining.